Preheat the oven to 425. Wash the squash. 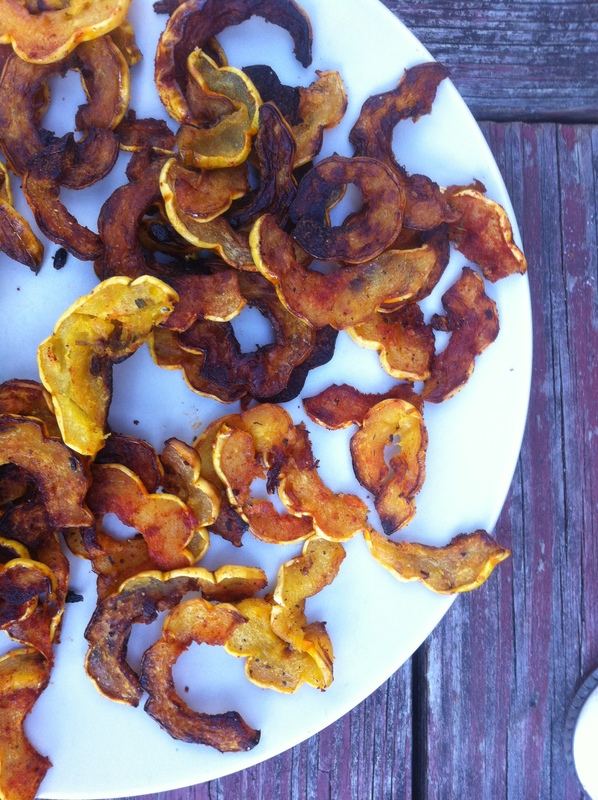 Cut the ends off the squash and cut it in half lengthwise. Scoop the seeds out. Slice the squash into semi-circles about 1/4 inch thick. Toss with enough olive oil to cover and spread in a single layer on a baking sheet. Bake for 20 – 25 minutes until brown and crisp. Turn/stir often so that they brown evenly. Turn the oven off and take the squash out. Sprinkle with paprika, salt and lots of black pepper, and stir/turn again. Return to the hot oven for a couple of minutes to crisp up. Combine everything but the olive oil in a food processor and process until fairly smooth. While the machine is running, add the olive oil in a smooth drizzle. Process until smooth and creamy. Add a few tablespoons of water so it’s just as thin and smooth as you like it…mine was the consistency of heavy cream. In a food processor process the pistachios, spinach, bread, garlic and herbs till finely chopped. Add the olive oil and balsamic and process till smooth. Add enough water to make the mixture about as thick as heavy cream, and process until velvety smooth. In a medium-sized saucepan over medium heat, warm the olive oil. Add the shallot, cook till it starts to brown. Add the garlic and the herbs. Cook for a few minutes. Add the lentils. Stir to coat, and cook for a few minutes. Then add about 4 cups of water. Bring to a boil, reduce heat, and simmer for 25 minutes to half an hour. Till the lentils are soft, but still have some substance. Drain (you can save the water for broth, but it will be dark!). In a medium saucepan over medium heat warm the olive oil and bay leaves. Add the dried rices and farro. Stir to toast for a few minutes. Add 2 cups of water and a shake of salt. Bring to a boil. Cover and turn the heat to very low. Simmer for about twenty minutes until all the water is absorbed. Turn off the heat and uncover, but leave on the burner for a minute or two. Add butter, balsamic, salt and pepper. Pile some lettuce and arugula on a plate. 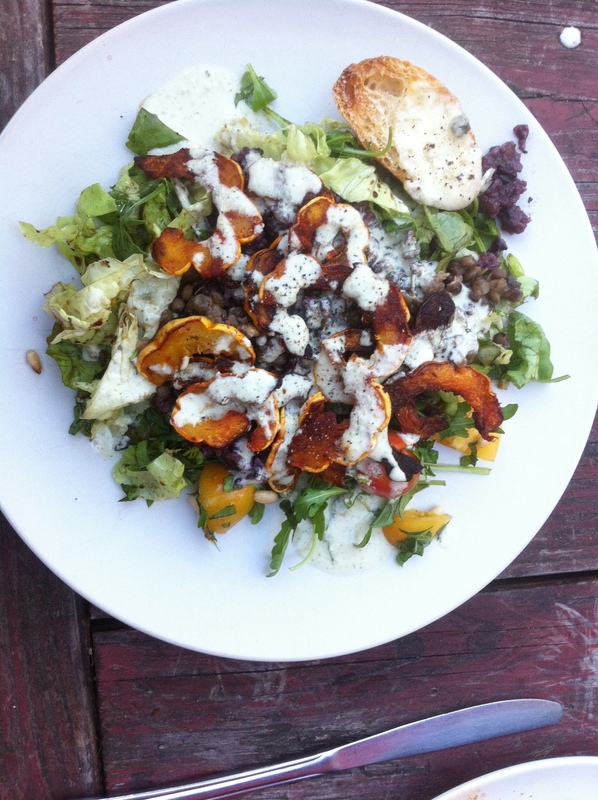 Top with rice, then lentils, then roasted squash then aioli, and scatter pine nuts on top. Combine everything in a food processor and whizz until fairly smooth. It will still have some texture. I always top one crust with tomato sauce and mozzarella. And the other…Pour the pesto mixture into the crust. Scatter the tomatoes and squash over the top of that, then scatter mozzarella over that, then scatter a small handful of pine nuts over that. 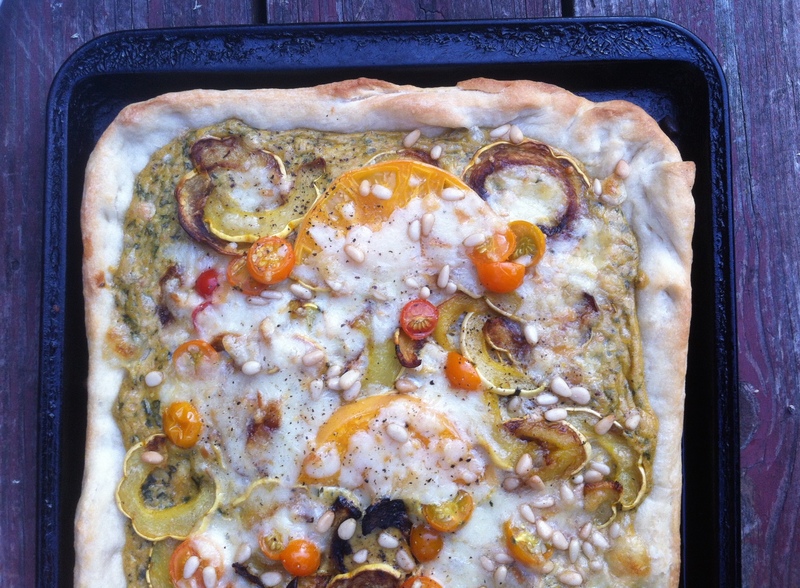 This entry was posted in crust, lentil, pie, rice, salad and tagged delicata squash, ecstasy, pizza, the idiot by Claire. Bookmark the permalink.